Paint with Passion Out Now! Hello painting friends. We are very excited to announce our New Online Floral /Still Life painting course. "Paint with Passion"
This will be our first online painting course and it will be available worldwide to all subscribers that have high speed internet access. The online course is designed for beginner through advanced painters. All painting lessons for the course will be instructed by Gary and Kathwren Jenkins. Both have been working as full time professional artists/teachers for well over 50 years and have been involved in almost every phase of the art business. In our "Paint with Passion" Floral /Still Life online course we will show you many of our Jenkins style signature painting techniques that we have developed over the past 50 years. Please watch the videos below for more information on our New Online Painting Course "Paint with Passion". Our new online "Paint with Passion" painting course is a Floral /Still Life insturctional art course that is painted with oil paint. 1 hour too 3 hours long the paintings will be broken down into segments/parts, for easier viewing. All of the course material will be ready for you to start downloading, once the registration period opens. All the instructional material will be held for you on our special server so you can watch it any time you want, whenever it is convenient for you. Our "Paint with Passion" Online Painting Course Might Be Just The Right Learning Solution For You. Imagine being able to stay home, in the privacy, comfort and convenience of your own studio or workspace, with your easel and your computer, and learn to paint beautiful Floral/Still Life oil paintings. Whether you are a beginner or a more advanced painter, you can learn to paint at your own pace and not have to worry about pushing to finish at a certain time. Maybe you are a little shy about painting in a classroom environment, then an Online course may be just what you need. And think of the money you will save as opposed to traveling to an out of state seminar. and take the time to travel to a seminar. Access Lessons from any device connected to high speed internet. Our "Paint with Passion" course is available to any persons WORLDWIDE that have high speed Internet access and is able to read the English language. You can access the course from your Desktop PC, Mac, Tablet, iPad, or mobile device. Downloading the companion items in the course will be easy and user friendly. Any persons that fills out the required registration form to subscribe to the course, and pays the fee for the full course. Once you subscribe and pay for the course you will be assigned a special password/code, which will allow you to log onto the course so you can start watching the video lessons and downloading companion material. Floral Still Life painting for yourself or your students Then this course is for you. Students will learn about brush stroke techniques, composition and design, setting up a still life, lighting your set- up, mixing colors, what brushes to use and their different styles and when to use them. What mediums to use and when or when not to use them. 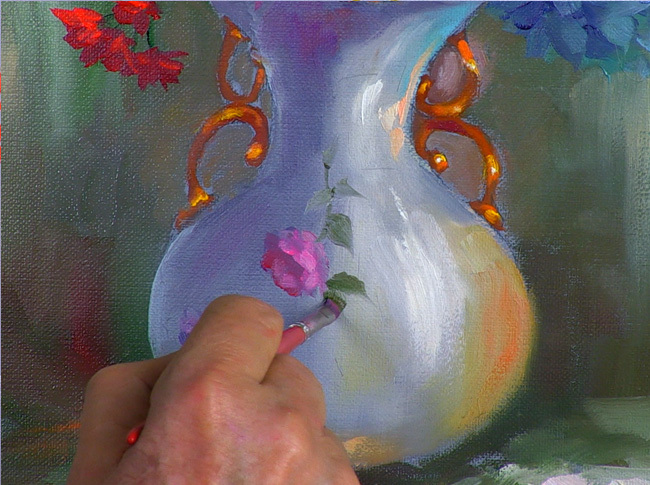 Each video lesson will show you how to paint a beautiful completed Floral/Still Life painting. In addition to to learning to paint several types of decorative vases and pots, you will learn to paint some realistic, yet simple to do, fruit. You will learn how to use simple fabric swatches to enhance the backgrounds of your Still Life set up. We will also teach you how to paint many different types of flowers and foliage, using easy to follow, slow detailed strokes. We will show you how and what to use to prepare the background of your canvas using acrylic paint before you start to use the oil paint. Different quick and easy background and foreground techniques will also be demonstrated. All of the paintings are taught in the well known Jenkins style, which is a semi-loose, but a very realistic style. They are not real loose impressionism, nor are they really tight photo realism. Each of the paintings are taught very slowly and detailed and in an easily understandable manner. In addition to the 8 individual painting videos, we have added a special feature for you that will be a Technique/General Information video. These videos will talk about supplies needed for the course, what brands we recommend, setting up your painting space, care and cleaning of your brushes, mediums and their uses, varnishing your paintings, why do you need to varnish, what we use and how to apply it, what is graphite paper? and how to use it to transfer the patterns onto the canvas. We will also show you how to apply some decorative borders to your paintings. Simple accent borders using Gold Leaf, Embossed Gold Leaf and the use of Stencils. 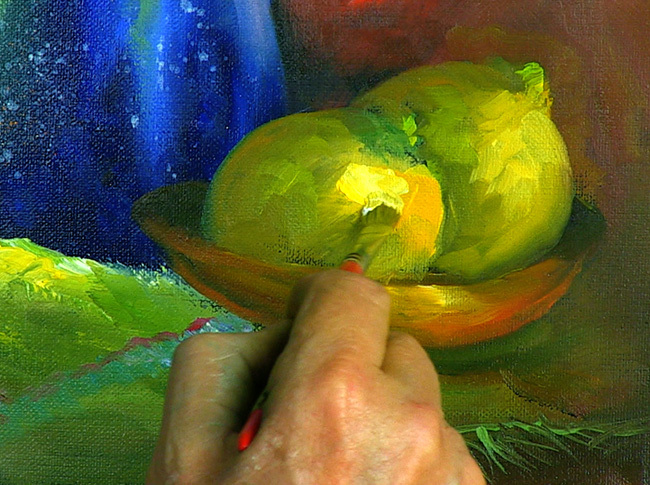 On the Technique videos, Kathwren will demonstrate many of the elements that are in each of the individual painting videos. For example, Kathwren will demonstrate in very slow detail how to paint several of the flowers and foliage that are in each painting, directional brush stroke lines, the push down-lift up and sweep away stroke, when to use the paint in a thin, watercolor like consistency and when to use it in a thicker or dry consistency. We will show you how to paint and blend the many different kinds of brush strokes for the backgrounds, such as vertical, horizontal, and criss-cross strokes. There will also be detailed information about mixing the oil paint colors. The Technique videos will be long playing lessons so it will be broken down into several segments/chapters for easier downloading. So if you wish to skip over some of the general information material, you can do so, or if you wish to view some of the painting demos multiple times, then the different segments will make that easy for you. There will be a Private Facebook page set up for all subscribers of the course. On this FB page if students wish to, they can post pictures of the paintings they are doing in the course. They can post their paintings in the work in progress or the finished stage, so that other students in the course can see and comment on each others work. Students can share their special thoughts about their painting experiences and ideas, and talk about their love of painting with other students that have the same interest. On the Private Facebook page, and for the students that request it, we will be happy to give you good, constructive critiques/comments on your paintings as you progress through the course. That way, other students can also learn from each other and how some of the comments can help them with their own work. NOTE; Since all critiques will be given by Gary or Kathwren, this will be done on a ''as time allows'' basis. Once the students complete all the paintings in the course, they can email us photos of their paintings. Once we have seen all of your finished paintings, you will be sent a Certificate Of Completion, stating that you have participated in the "Paint with Passion" online course and you have successfully completed all the paintings. The certificate will be personally signed by Gary and Kathwren, and will either be available to download or will be mailed to you. 8 FULL LENGTH FLORAL/STILL LIFE PAINTING VIDEO LESSONS. 7 of the paintings will be Instructed by Gary Jenkins. 1 of the paintings will be Instructed by Kathwren Jenkins. Each of these long play painting videos will be between 2 to 3 hours in length. There is a total of 17 hours of painting instruction. This is a separate long play video showing how to paint many of the elements in great detail that are in the 8 painting videos. Also, much more information on this video. It will be instructed by Kathwren Jenkins. This separate Technique video will be 3 to 4 hours in length. A nice size color photo of each of the 8 paintings will be included. A full size pattern that you can transfer onto your canvas will be included for each of the 8 paintings. Note; You do not have to use the pattern if you don't wish to. If you are good at drawing, you may want to draw the compositions free hand. But if you are not very proficient at drawing, we recommend using the patterns. it is very convenient, saves time and you will be assured that your drawing is very accurate. All Patterns Are Sized For 14x18 And 16x20 Canvas. A complete written supply list for all the supplies needed for the course will be included. Oil paint list, mediums ,brushes ,and other miscellaneous supplies. Names, sizes and styles of brushes will be listed. Also ,what oil paint brands we recommend. We will also include some names and contact information on where to find many of the materials listed. Be sure to sign our contact list and give us your name and email address so we can be sure to contact you when our registration period will open. Please email or call us at the JENKINS ART STUDIO if you have any questions about the course. The technical specifications of this course are simple. If you are connected to a high speed internet connection and can watch a video on Facebook, You Tube, Netflix, Hulu then you can enjoy our Paint with Passion on-line course on your desktop computer, Mac, tablet, iPad, or mobile device. Other requirements are the ability to download and print patterns and photos in .jpeg format for reference. Subscriptions access is open for 2 years. Students will have access to all Paint with Passion lessons for 24 months from sign up date. As a student, you are paying for access to our Paint with Passion on-line school. There are no refunds or cancelled subscriptions. Our subscriptions, access is open for 2 years. Students will have access to each individual lesson for 24 months from the day the student first enrolled. All Video, Images and Text Copyright 2018 Jenkins Art Studio. From the first moment I first logged on to Gary and Kathwren Jenkins “PAINT WITH PASSION” online course, I knew this was going to be a winner. I watched the general Information/Technique video first, which was very detailed and informative, even for seasoned painters. There’s some good information in there. Then I watched the first of the Floral painting videos, which was in two parts. The video and audio were very clear and Gary went in to great detail to show what he was doing by effective use of close ups. I look forward to watching again, but this time I will be painting along. I look forward to painting each of the eight lessons. I would recommend Gary and Kathwren’s eight lesson online course to anyone who is looking to grow as an artist. Gary has a calming voice and challenges you to improve your skills by going out of your comfort zone. Thank you both for making these lessons available. I am so excited about your new online course. It is exactly to my taste. I like the graphic design, the clarity and the simplicity. I also appreciated very easy registration and payment. Everything went smoothly and quickly. I love the selection of picture themes. They represent all possible types of Vases, Flowers, Backgrounds and Techniques, as well as very detailed instructions. And I also appreciate distinct English, especially as a foreigner whose native language is not English. So far I have seen all the information and technical videos and I am already preparing to paint. When I will paint a picture, I will send a photo. I hope I have expressed my feelings exactly, and I wish you many satisfied students. I am loving your online course. Simple and easy to navigate layout. Love your style and attitude. The ‘’it’s okay if you mess up’’ has freed me to play and experiment, and relax and have fun. I’ve always been a rule follower. I admit when I watched the first video, I felt a little doubtful of my ability. Lots of encouraging words. The paintings are all beautiful beyond words and offer such a variety. I appreciate the slower techniques video. I have already learned a lot. I have been watching and watching, so yesterday I decided to roll up my sleeves and give it a try. Because the Poppies were a little different then what I’m used to seeing, I admit I was a little hesitant. Once I got started I loved it. Good stretch and learning experience. I struggle more with the small bottom flowers then anything else. Thank you for all you have done for so many years. I do have one problem. I don’t want to do housework, grocery shop or cook now. Having too much fun. I have known of Gary Jenkins from 30+ years ago when he was painting on National PBS Television. I watched religiously every time he was on. Several years later, I had the opportunity to become a J-CAT, Jenkins Certified Art Teacher. The launch of the Paint With Passion online course is a wonderful opportunity to use the technology available to us now and have a more in depth experience with the Jenkins than the 30 minute TV programs, that until now, were all we had to watch. Kathwren and Gary have done a lot of work. They put forth much effort as well as did a wonderful job in finding the people to assist them in making this experience for us as good as it can be without them being in the room with us. One thing I think is even better, in my teaching I have found most times that I helped my students too much, that they didn’t learn to correct their painting accidents and mistakes, thus unintentionally making them dependent on me to ‘’fix’’ what they didn’t like. This course will give everyone the chance to mess up, wipe out and try again and make every person a better artist. Nothing is better than learning from our own mistakes and learning how to fix them. I love to learn and I am a firm believer, no matter how long, how much experience we have, or what we know about everything we endeavor to do ..... we never know so much we can’t learn any more. Nor will we ever know it all ! The reference materiel is great. All the descriptions and course materials as well as the patterns and photos are there for us. Good quality filming, sound and lighting and all around good experience for anyone out there no matter what level they were painting before starting this online course. — Lanette Campbell J-JAT Pascagoula, MS.